In 1982 I took my kids to Florida to visit their grandparents. We rode the Silver Meteor from New York to Tampa, returning on the same train from Clearwater. 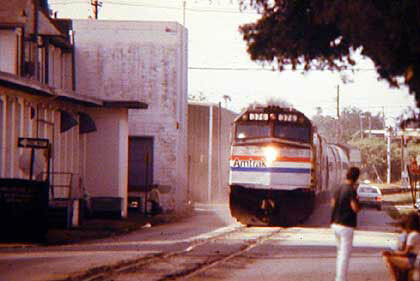 In those days Amtrak trains went through Tampa and on to Clearwater and St. Petersburg. Today the only remaining Tampa service (save connecting buses) is the Palmetto, which passes through this rapidly growing metropolis on its way across to Miami. Despite its origins in New York the train does not have a diner or sleeping car, that being replaced with a business class car. Our train, which merged with a Miami section in Jacksonville, had coaches, a lounge and sleeper, getting its diner when the trains combined. I remember a delightful trip, with good food, on-time service, games for the kids and lots of friendly passengers who adopted them for the duration. On the left is the train in Tampa, on the right a shot of it arriving in Clearwater. 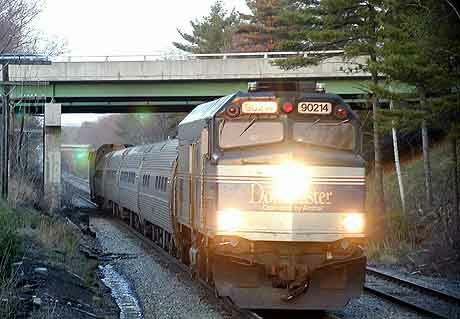 It's May 1, 2004, and we stopped by the new transportation center in Wells, Maine, to poke around and photograph Amtrak's Downeaster, shown here arriving from Portland on its way on down to Boston -- one of four trips each way per day. 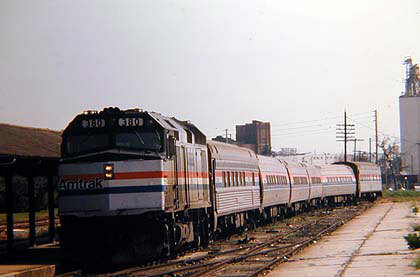 Equipment included a business class car, standard Amfleet coaches and a cafe car. 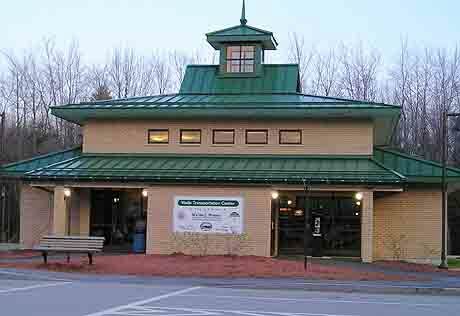 Though there's been some loss of patronage, the possibility of faster running times and dropping of the requirement that coach passengers get reservations may help, as will the intermodal philosophy at places like Wells, which now have very comfortable staffed stations. If there's a downside it's the fact that there is virtually no external maintenance on these trains. A regular passenger I met said that seldom, if ever, are the windows washed, and when I pointed to them the conductor laughed and said "Amtrak depends on mother nature.". Why Amtrak would permit this to happen on a route that has many splendid views and wants to attract vacationers is beyond me. Come on guys, clean up your act. 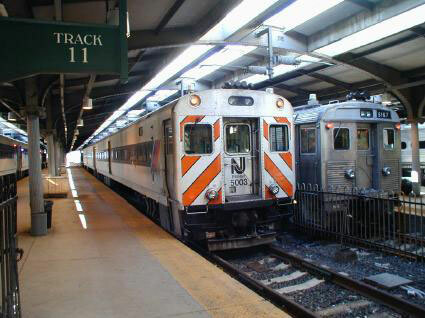 Here are two photos of New Jersey Transit trains, the one on the left taken in the glorious Hoboken terminal, the one on the right in the beautifully restored Penn Station in Newark. Both were taken less than two months after September 11, 2001. If the terrorist-frightened bureaucracy that runs NJT enforces its new regulations to the hilt such casual photography by railfans or unwitting travelers will make them subject to arrest -- even if photos of trains are taken from public places like highways and parks -- something we understand has started to happen to hapless folks photographing the new light rail line around Camden from nearby streets. Having been highly inconvenienced by 9/11 (as was my wife and New Yorker daughter) we have no truck for anyone blowing up buildings or trains and, in fact, are now extremely watchful whenever we're hanging around to take photos -- like many who love railroads we're an extension of the local gendarmes. This said, it is hard to imagine a better example of how the terrorists have won a round and chipped away at the freedoms so many Americans have fought and died for. And, it could get worse. Right wing politicians are all over Amtrak for running a photo contest and the likes of TIME magazine have recently portrayed railroad photographers as nut cases, consumed by a hobby best left to the psychologist's couch. 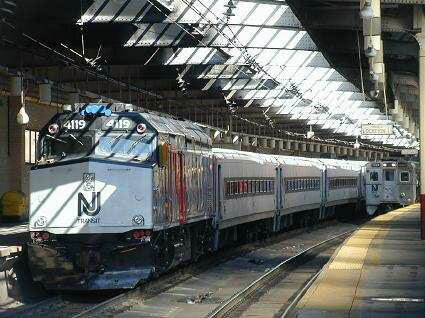 We think it's NJT that should get its head examined. Self-respecting terrorists in a day of camera phones and wristwatch cameras aren't going to stand on a platform visibly taking photos like a railfan. And in a day with architectural renderings of major stations are easy to get, one can ride the entire NE Corridor on a personal computer, or watch videos of practically every train in America we can only see this as a public relations gimmick that is a harbinger of worse to come. This photographer-historian has only been detained by police twice for photographing trains, both times in dictatorial countries. What's next, airplanes, Times Square, the Golden Gate Bridge, federal highways? And what about those timetables and flight trackers on the web?????? 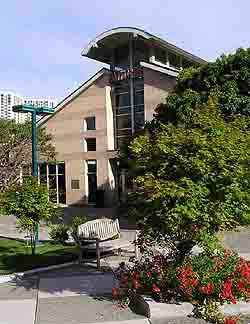 In May 2004 I returned to the Bay Area to do some train riding. The good news is that the California Capitol Corridor service, pictured here in Emeryville, is alive, well and, I must say, exemplary in many ways. From good timekeeping, to clean trains, friendly on-board service, attractive and well-kept stations, and fine literature and branding, it's hard to have a better train experience -- and I say that in a period in which I've enjoyed some of the best in Germany, Sweden and the UK. So kudos to Amtrak California, which offers quite a contrast to whomever runs the California Zephyr in those parts. My Zephyr ride up to Truckee was dismal -- filthy and deteriorated train windows and exterior, surly dining car staff, demoralized attendants, virtually no branding, and timekeeping and information about train status so awful I had to cancel a leg of my trip -- bumming a ride to Sacramento and picking up a Capitol train there. Changes last made on: July 14, 2004.